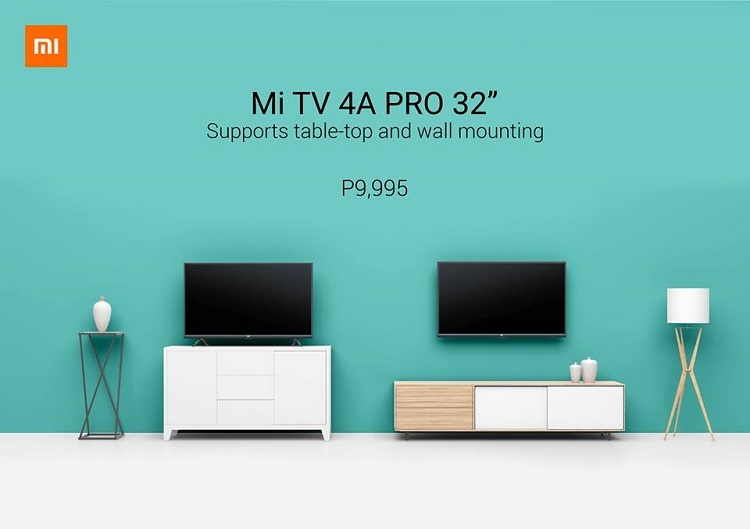 Xiaomi has announced the arrival of their affordable Mi TV 4A Pro in the Philippines, allowing consumers to equip their home with a smart TV for as low as Php10K. Comes with table-top and wall mount support, the Mi TV 4A features a 32-inch LED display with 1366 x 768 pixels. One can surely elevate their viewing experience with the device, too, as it delivers 178-degree viewing angle, 60Hz refresh rate, and 6.5ms response time. Under the hood, it is powered by Amlogic Cortex A53 quad-core processor clocked at 1.5GHz, and is paired with Mali-450 MP3 graphics. Moreover, Xiaomi equipped it with 1GB of RAM and 8GB of eMMC storage. To complete your entertainment experience, the Mi TV 4A Pro is also packed with two 10W speakers, and DTS audio software to enable users improve their TV’s sound quality. The Mi TV 4A Pro also has basic connectivity features including WiFi, Bluetooth, HDMI, USB, Ethernet, and headphone jack slot. Meanwhile, the device can also support MPEG1/2/4, REAL, H.265, and H.264. It comes with 700,000 hours of content, as well. The Mi TV 4A Pro loads Android 8.1 Oreo with PatchWall – an AI TV sytem. The Xiaomi Mi TV 4A Pro is now available in the local shores for only Php9,995. You can get it at the official Mi Stores in TriNoma, SM Megamall, SM North Annex, and Gateway Mall.